Ciarán Galway speaks with Ireland’s Minister for Foreign Affairs, Simon Coveney about his role in the Brexit negotiations and efforts to resuscitate an ailing Northern Ireland Executive. Speaking prior to an agreement on phase one, Coveney welcomed progress made on a recognising the complexity of full implementation of the Good Friday Agreement. The Minister draws attention to the many agreed North-South co-operation projects and policies that essentially are built on the back of EU membership, north and south. For instance, the mirrored regulatory environment in terms of agriculture, animal health, food safety and environmental management. “I think the complexity of that is now clear to both negotiating teams. So, we are in the middle of a mapping exercise to try to itemise issue by issue, how we might be able to deal with that,” he discloses. 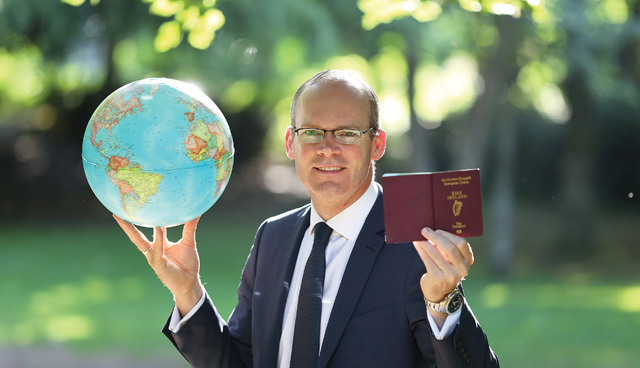 The area in which Coveney feels the most progress has been made is the common travel area which concerns the movement of British and Irish citizens between the islands, working, accessing welfare, support and pensions. “I think that one of the early wins of these negotiations, although it’s not that clear at this stage, will be an acceptance, by both sides, that the common travel area as we understand it will be maintained. Describing the rights of Irish citizens living in Northern Ireland as “hugely important” and “quite a unique circumstance”, the Minister explains that, if and when Northern Ireland leaves the EU, those residents choosing Irish citizenship are also choosing EU citizenship. There is an obligation, therefore, “that the rights of Irish citizens in Northern Ireland are actually fulfilled in the context of accessing healthcare in other European countries even though they will now be living outside the EU. These are difficult and complex issues which people were not discussing during the referendum, at least not outside of Northern Ireland, and are now very real and practical,” Coveney explains. Through a commitment to the full implementation of the GFA, these are difficulties which must now be addressed. Indeed, more recently, Taoiseach Leo Varadkar has suggested that Northern Ireland, or the UK as a whole, could continue to apply the rules of the customs union and the single market without being a member. The onus is on Britain and time is of the essence.